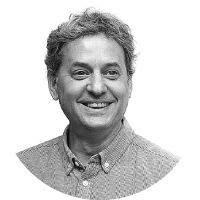 Doug Kessler is co-founder and creative director of Velocity Partners, the London- and New York-based B2B marketing agency (and the CMA Agency of the Year 2016). Doug has written a lot about content marketing including the B2B Content Strategy Checklist, Insane Honesty in Content Marketing and Crap: Why the Biggest Threat to Content Marketing is Content Marketing. Like everyone else, I’m still on the steep part of the content marketing learning curve. I started on Madison Avenue— at Ogilvy New York— and quickly ran from consumer marketing to B2B. I couldn’t keep a straight face when talking about the importance of bounce, body and shine. I think I’ve always been a content guy at heart, even before we all called it that. The idea of using your expertise to help prospects think about key issues always felt better to me than giving them branded pens or stress-balls. I love what content can do for demand generation. But I’m worried that B2B companies are missing what content can do for their brands, too. That content can capture and celebrate your values and beliefs so that your prospects really understand what you’re about. If content becomes that colourless, odourless fluid that we pump into our marketing automation machines, we’re losing something important. Content can move markets. But only if you aim high. The data side of things is critically important. Content Performance is the fastest growing part of our agency. But in my heart, I KNOW that what works is hitting creative home runs (as well as answering every question your prospects might have). GE – for their daring, experimental mindset. Airbnb – for combining utility with brand and voice. Our clients – for sticking their necks out by choosing this weird and wonderful agency. For B2B Tech companies: Content strategy, content performance and long-term content programs. Also positioning and branding. The very best way: Send Lagavulin 16 year-old to either the London or NYC office.